Complete Petrol Station Guide – Get the information you need to make an informed decision now before buying a petrol station! Welcome to our Complete Petrol Station Guide, thousands of South Africans dream of owning petrol stations because they favor the idea of being in control and earning an excellent income. The guidebook addresses the due diligence, location, working with brokers, basics of writing the business plan, introduction to setting up a fuel station, getting finance, and managing the garage. This Complete Petrol Station Guide is an overview of the fuel industry and the basics you need to know about environmental regulations, labor, licenses, registration, and safety specifically in South Africa regarding the setup, running and owning of a filling station. It also provides basic guidelines and links to important acts and resources for people who want to start or set-up their own service stations. The information comes from the Internet, government publications, interviews, and research. It is thus a compilation of the available information to help you in the process of gaining an overview of what is needed to start a fill station, what to look for when buying a fuel station and basics of running a forecourt in South Africa. Who should purchase the Complete Petrol Station report? Persons wanting to buy a fuel dealership. Business people interested in becoming forecourt franchisees. People who want information about setting up a service station. Anyone who needs guidance regarding the due diligence process for fill stations. Business people who want an overview of the drafting of the business plan. People who need to get financing for the buying of a petrol station. Anyone looking for information regarding such business opportunities for sale and brokers working specifically with filling stations. 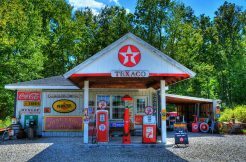 Anyone that wants an overview of all the factors to consider and wants information regarding fuel station business plan writers and brokers as well as contact details for all the parties involved. New fuel station owners needing guidance regarding management of the petrol station. Those who need to upgrade their fuel stations. People who need to apply for the site or retail licenses. The Complete Petrol Station Guide 2018 for South Africa explains aspects regarding retailing, locating, and evaluating a petrol station. Franchise fees, lease agreements, wages, environmental issues, financing, EPOS reports, due diligence aspects, layout, etc. are discussed – thus all the basics you need to know if you want to buy fuel stations in SA. It’s well-suited for someone looking for an overview. Shipment: Emailed within 24 hours of receiving proof of payment. Please email to info@pibbrokers.co.za to receive banking details as we don’t display the details for security reasons. You can make an EFT or direct bank deposit. Use your email address as a reference when making payment. Why Buy the Complete Petrol Station Guide? Checklists for due diligence included. Guidance regarding the writing of a business plan specifically for fuel stations. Overview and links to resources regarding the pump price, labor, forecourt management, and environmental regulations. List of business brokers and business consultants dealing specifically with garages and the purchasing as well as business plan writing process. Essential information about the various licenses involved including Site & Retail licenses. Guidance regarding service station business broker selection. Guidance regarding the buying process of petrol stations in SA. Factors to consider when setting up a petrol station. 118 Plus pages packed with links, lists, essential information, overviews, in-depth information, and guidance. Contains information about retail license applications and renewals. It also has information about brokers and consultants who can assist with the retail license applications. In addition, the guide includes information about site licenses and requirements. The guidelines make the process of drawing up a service station business plan and projections for a fuel forecourt a bit easier.Use the checklists for site and business auditing and ensure that you know what to look for in contracts. Get the basics and links about the various environmental and municipal regulations governing the fuel industry including underground storage tanks, the location of the fill station, forecourt layout and more. Contains essential links to ensure that you can always have access to important information. Being tricked into thinking the fuel station is profitable. Not complying with labor, environmental and statutory regulations. Making mistakes because you lack operational knowledge. With thousands of people looking to buy fuel stations in South Africa, you need a competitive edge. The petrol station guide will give you the information to help you get started. Please email to info@pibbrokers.co.za to receive banking details as we don’t display the details for security reasons. You can make an EFT or direct bank deposit. Use your email address as a reference when making payment.